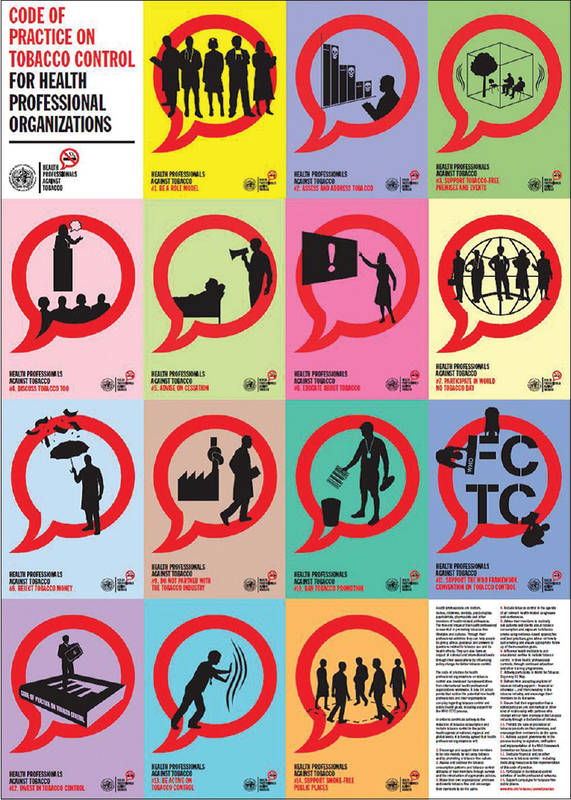 Background: Stroke is one of the leading causes of death and disability worldwide. Poststroke, most survivors experience trunk control impairment and instability. Previous works on exercise on an unstable surface to improve trunk stability in nonstroke population had proven effective. Thus, physioball exercises (PBEs) in poststroke subjects may be useful in the recovery of trunk stability and thereby reduce disability. We hypothesize that PBE is feasible and effective in enhancing trunk stability. Aims: To test the feasibility and successful implementation of conducting a randomized controlled study to assess the clinical effectiveness of PBE and proprioceptive neuromuscular facilitation (PNF) technique to enhance trunk control in poststroke subjects. Methods: This study was conducted in a stroke unit of Global Hospitals and Health City, Chennai, India. 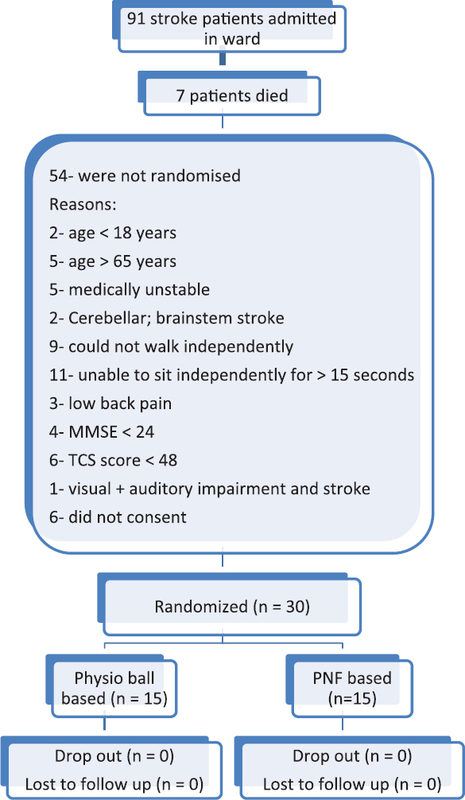 Thirty patients with the first onset of stroke within 40 days of stroke duration, lesion to one side, and ability to sit independently with or without arm support for 15 days were recruited. All thirty poststroke subjects were randomized either into PBE group or PNF group, and outcome assessors involved in the trail were blinded to allocation. PBE group performed task-oriented activities on an unstable surface and PNF group were treated with PNF-specific trunk stability exercise program for 4 weeks (30 min/day, 5 times/week). Trunk impairment scale (TIS) was used as a main outcome measure. Results: Data were analyzed using Wilcoxon signed rank sum test and Mann–Whitney U-test for intra- and inter-group comparison. The baseline characteristics between both groups were statistically nonsignificant. Within groups, there were significant improvements between baseline and at 4 weeks in the measure of TIS. In addition, PBE group showed a significant increase in trunk control (mean 2.33, 95% confidence interval 1.14-3.52, P = 0.002) than the PNF subject. Conclusion: This pilot randomized controlled trial (RCT) showed the potential efficacy of PBE in developing more trunk stability than PNF in poststroke subjects. The current study had proved the feasibility of undertaking a large-scale RCT. Since this is a pilot study to establish any sort of conclusive evidence on the efficacy of PBEs in the poststroke population, a larger sample-sized trial is needed. Background: Over the years, coronary angiogram (CAG) has evolved to become indispensable diagnostic and therapeutic procedure for coronary artery disease (CAD). The procedure even though minimally invasive with shorter length of hospital stay and low cost has some risk for morbidity and even mortality. Large extents of the risks are dependent on the clinical status of the patient at the time of the study and comorbid illness. Aims: The present study was planned to assess the complications and to identify the risk factors associated with complications among patients undergoing CAG for CAD. Methods: A cross-sectional observational design was used in 250 patients who underwent diagnostic or interventional procedure of CAG through either transradial or femoral route. The convenience sampling technique was used to select the study sample. Results: Majority (32.8%) of the patients were in the age group of 50-59 years, followed by 28.0% of the patients in the age group of 60-69 years. Male preponderance was noted (87.6%). 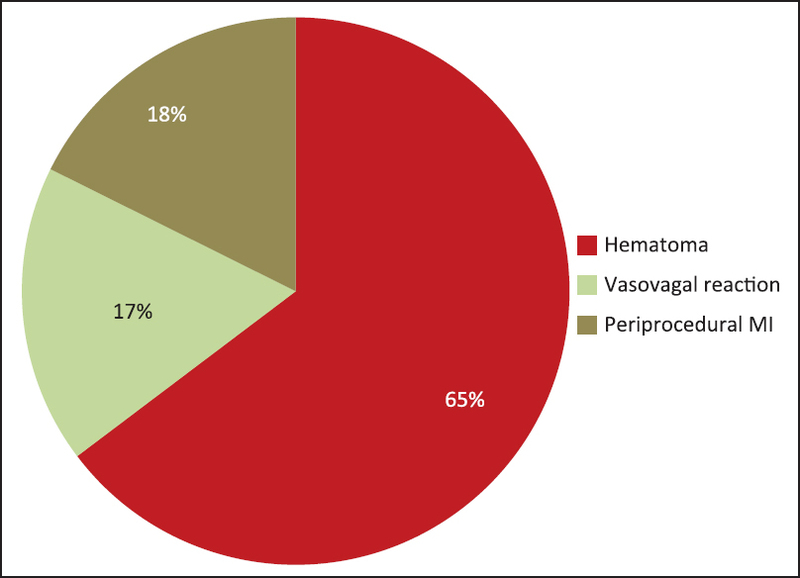 About 6.8% of the participants had developed complications, among them 4.4% had hematoma, 1.2% had vasovagal reactions, and 1.2% had periprocedural myocardial infarction. History of current smoking was identified as risk factor for complications (P< 0.05). The risk of complications was higher in percutaneous coronary intervention (PCI) patients, (odds ratio 6.21 [1.96-19.68] at 95% confidence interval) and who had femoral access site (P< 0.05). Conclusion: Even as the improved patient outcome is seen with cardiac catheterization, it is not totally free from risk. Newer strategies such as radial approach have managed to reduce the risks considerably. History of smoking, femoral access, and PCI were identified as risk factor for complications following CAG. Background: Cerebrovascular accident is the most common and devastating disorders in old age group. The diagnosis of stroke remains a clinical one, with confirmatory evidence obtained through neuroimaging. Neurobiochemical markers have gained special importance in the determination of brain damage resulting from acute stroke. Aim: In this study, we aimed to evaluate serum S-100 protein in blood samples from patients with acute ischemic stroke and investigate the relationship of serum S-100 protein level with the involved territory and size of the lesion. Methods: This was a prospective observational study conducted among 94 patients of acute ischemic stroke admitted to the Medicine Department within 48 h. Serum sample was collected within 48 h and was sent for measurement of serum S-100 protein level. Patients were classified according to involved territory as anterior cerebral artery (ACA), middle cerebral artery (MCA), posterior cerebral artery (PCA), and more than one territory and correlate it with S-100 protein level. 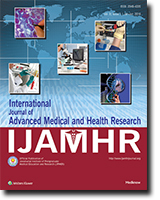 All patients had cranial computerized tomography scan and magnetic resonance imaging in the first 48 h. Neurological examination was done with National Institute of Health Stroke Scale in acute stage and Rankin scale at the time of discharge. 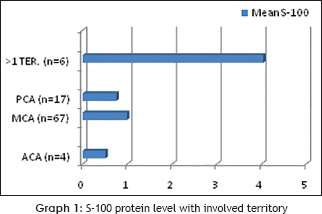 Results: Serum S-100 protein levels were significantly higher and maximum in multiple territory involvements followed by MCA, PCA, and ACA infarct. Conclusions: As serum S-100 protein level correlates with the involved territory or infarct size, we can predict the involved territory with the level of S-100 protein. Background: Seeking assistance from multiple physicians for an illness is a major obstacle in providing efficient care by the health care systems. It not only alters the disease condition but also adds to excess health care costs. This study aimed at exploring healthcare-seeking behavior in adult patients with diabetes and also to identify the factors associated with doctor-shopping behavior. Methods: This questionnaire-based cross-sectional study was conducted in an urban ward of Puducherry. A total of 100 patients aged more than 18 years with diabetes were included in the study. Results: Around 80% of the study subjects were availing treatment from government facilities. Prevalence of doctor-shopping behavior was found to be 14%. 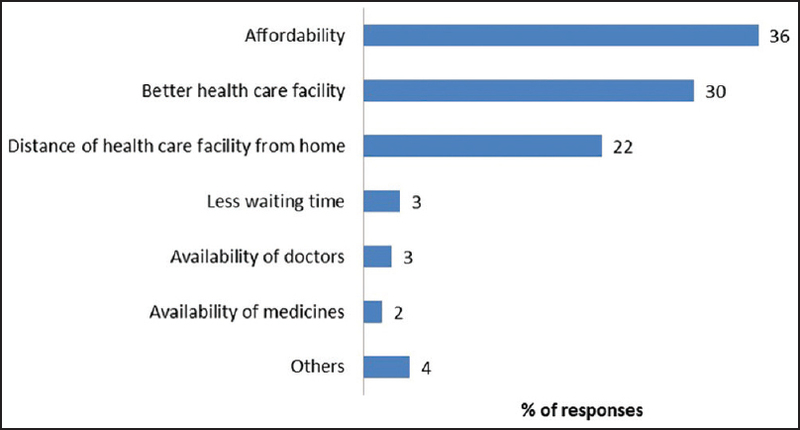 Reasons for change in their treatment facility were mainly due to patient-related factors like unaffordability of medicines and consultant fees, or illness-related factors like no improvement in symptoms. Physician/facility-related factors were due to prolonged waiting hours and poor interpersonal communication by the doctor. Various factors associated with doctor-shopping behavior in diabetics such as chronicity of illness (P< 0.005), past treatment facility being private (P< 0.001), and upper socioeconomic status (P = 0.045) were statistically found to be significant. Conclusion: The present study shows the prevalence of doctor shopping among diabetic patients to be 14% in urban Puducherry and this change in consultation was mainly due to the patient, illness, physician, or facility-related factors. Patient education, good interpersonal communication skills, and health system strengthening measures can increase responsiveness of the community toward the health systems and thereby reduce doctor shopping behavior among diabetic patients. A wide variety of disorders of diverse pathogenic mechanisms can trigger spinal cord dysfunction in HIV-1-infected patients. The most common such condition is HIV-1-associated myelopathy (HAM) which characteristically seen during advanced HIV infection in patients with low CD4 cell counts and previous AIDS-defining diagnoses. Histologically seen in approximately 30% of AIDS patients, but only 10% have clinical symptoms related to the disease. We describe an unusual case of HAM in previously asymptomatic patient with relatively low CD4 cell count (78 cells/mm3). The patient unaware of her seropositive status presented with a clinically slowly progressive myelopathy with difficulty in walking without assistance. We discharged a patient on antiretroviral therapy. We also review the disorders reported to derange spinal cord function in previously asymptomatic HIV-1 infected patients with preserved counts. 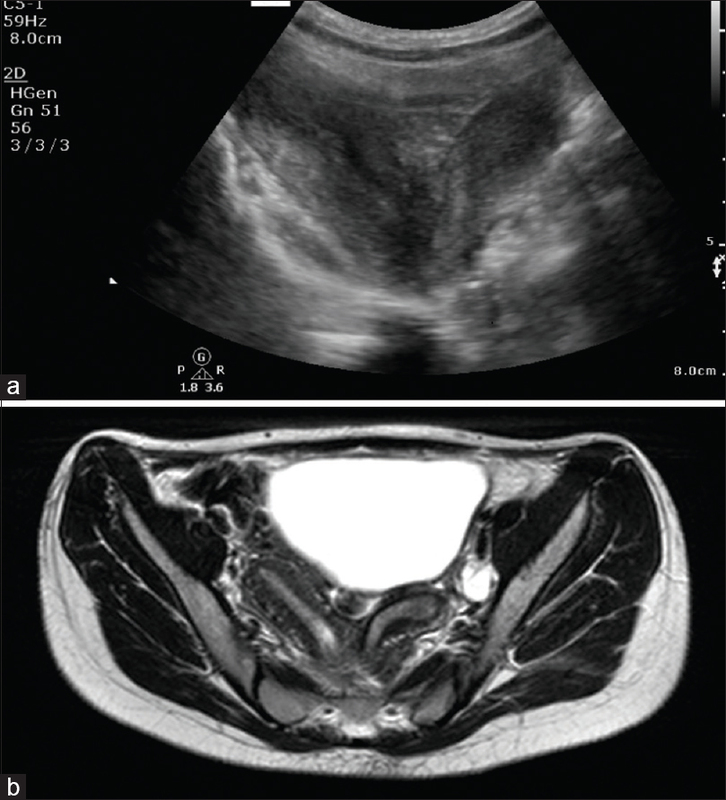 Obstructed hemivagina and ipsilateral renal anomaly syndrome is a rare group of urogenital anomalies in which unilateral genital anomaly is associated with ipsilateral renal anomaly. We describe imaging findings in a 14-year-old female patient who presented with cyclical lower abdominal pain. Typhoid fever is a common childhood infectious illness in resource-poor countries. Gastrointestinal manifestations are common presentation in this illness. We report a series of 3 cases with acute abdominal pain as presenting feature which were initially presumed to have a surgical emergency but were later on diagnosed to have typhoid fever. Confounding presentations and unusual features can sometimes pose a diagnostic dilemma even in a common illness.